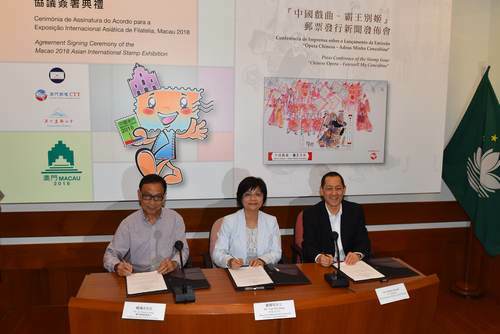 Macao Post and Telecommunications Bureau will co-host the Macao 2018 Asian International Stamp Exhibition with the Macao Philatelic Association. The exhibition is under the patronage of Federation of Inter-Asian Philately (FIAP). The agreement signing ceremony will be held on 6th June, at 3:00 p.m. at the Headquarters of Macao Post and Telecommunications Bureau. The Asian International Stamp Exhibition is a regional philatelic exhibition established by FIAP since 1977, aiming to develop the philately industry. It is the first time that the exhibition held in Macao. This exhibition will be held at the Convention and Exhibition Centre of the Venetian Macao, from 21st to 24th, September 2018. Philatelists from different regions will display their collections and join the philatelic contest. Aside from the precious stamp exhibition, the overseas postal administrations and philatelic dealers will be invited to participate in this event and hold sales booths. The regional culture and friendship will be promoted and enhanced through the stamps. During the exhibition period, there are theme day, philatelists’ seminars, stamp designer autograph sessions and family workshops, etc.